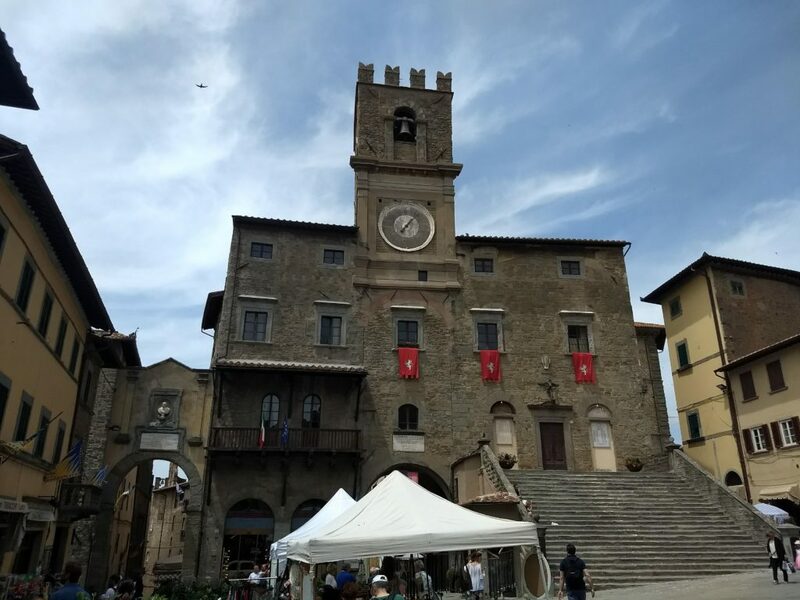 A good friend and old colleague of mine was getting married in Tuscany at the end of May. A good opportunity to add some extra days to the event and tour around some of the region i thought. 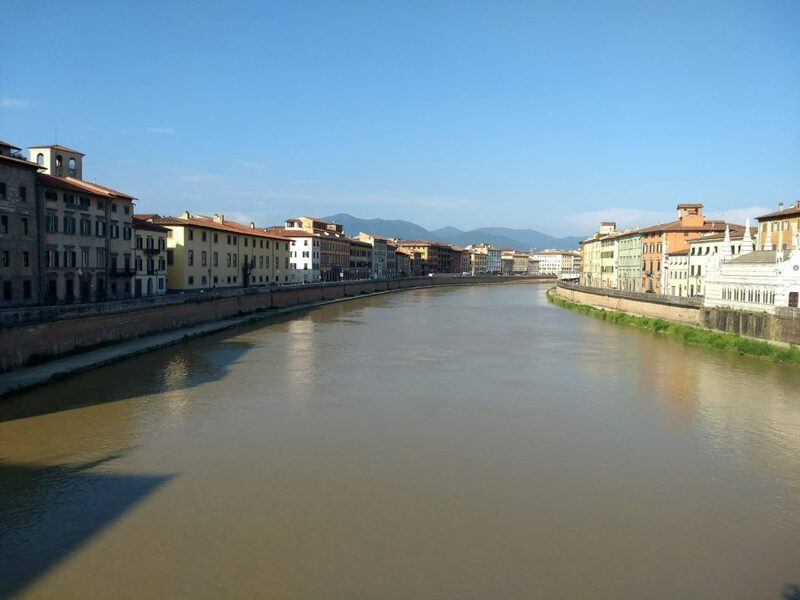 I flew into Pisa and took the shuttle train into the town center, it stops right next to main train station. 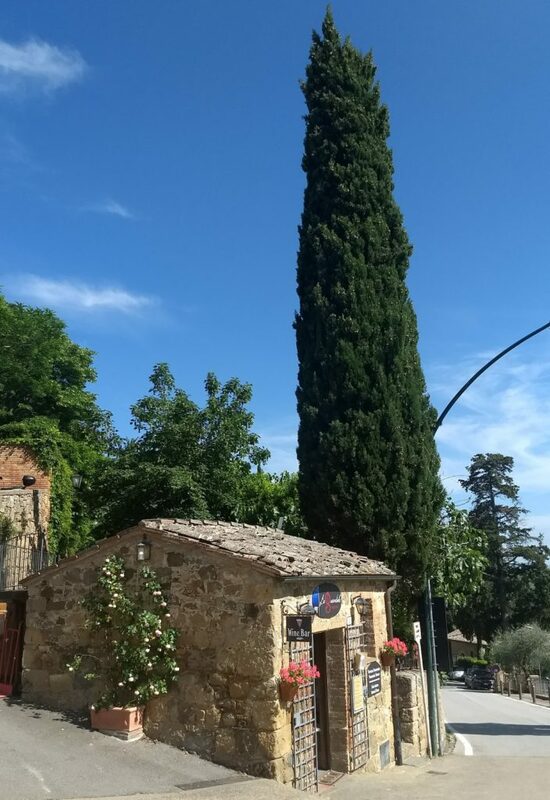 I had booked an AirBnB which was only a few minutes walk from the leaning tower. After finding my accomodation i went for a walk to get my bearings of the city. 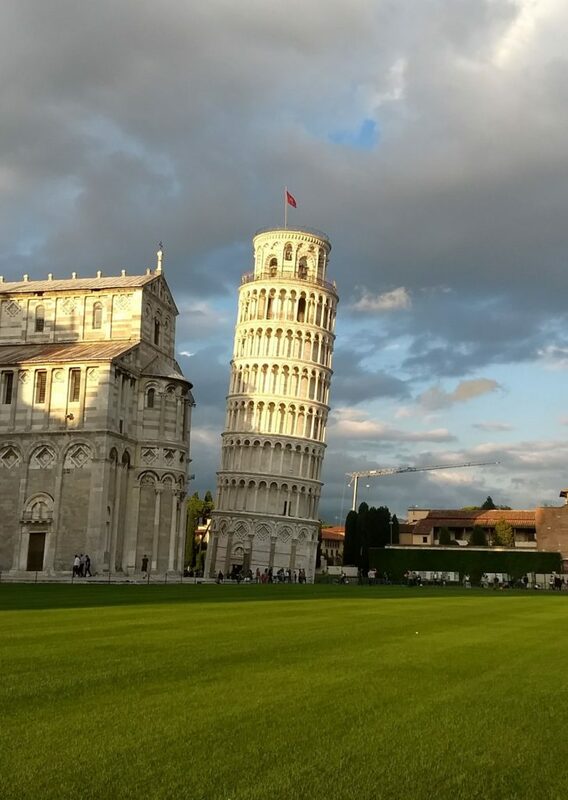 I didn’t want to see the leaning tower as i had two full days in Pisa and so wanted to see it another day to give me something to do. As i turned a corner i saw a big archway in a stone wall and intrigued i walked through it. There in front of me was the wonkiest building i had ever seen. Damn – i had found it. 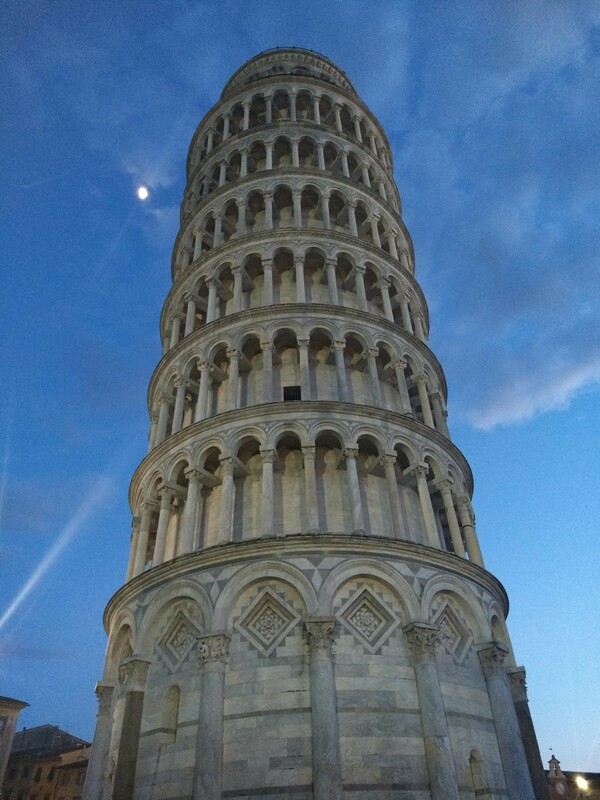 The leaning tower was firmed up a few years ago so it no longer gets any worse – its just always going to be at the same angle forever more. Apparantly around 4 degrees. You can pay to go up it but the queue was long and i think you may need to pre-book to ensure you get a ticket. Whilst staying with my AirBnB hosts they told me about a place on the coast not far from Pisa, easily accessible by train. It was described as a smaller version of the Amalfi coast. 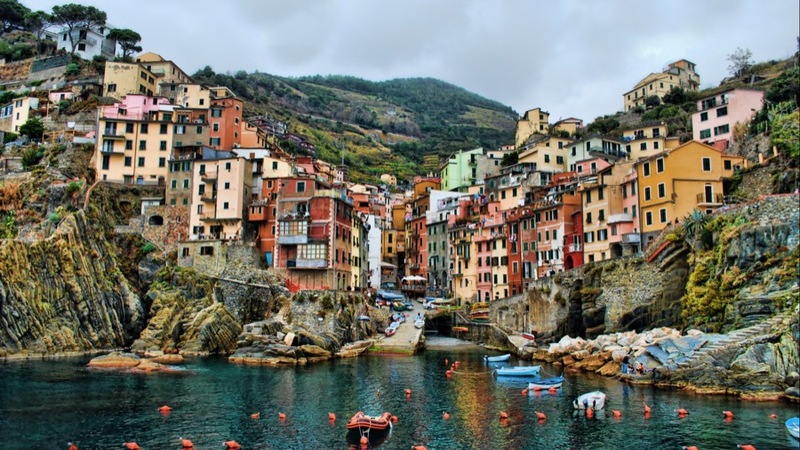 The place is called Cinque Terre and is a series of five small coastal villages built into the rugged coastline. 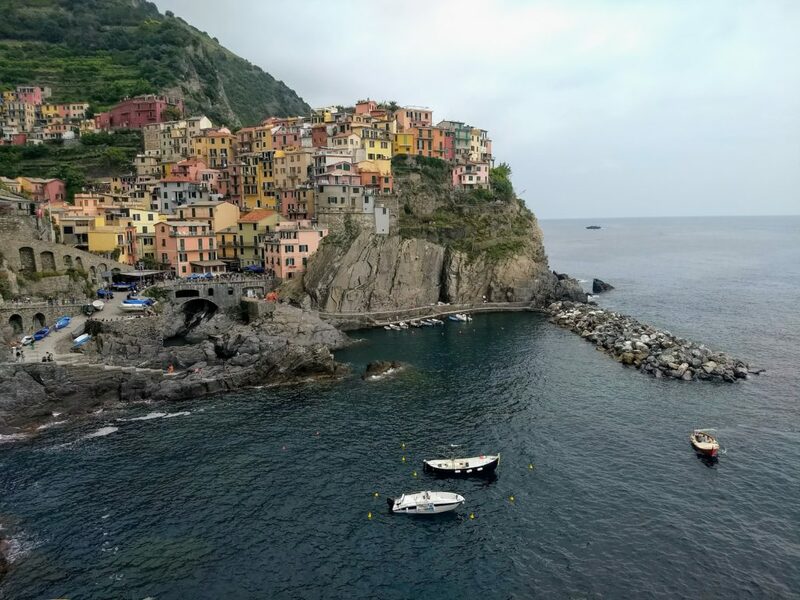 Cinque Terre is yet another UNESCO World heritage site, apparantly there are more sites in Italy than any other country !! 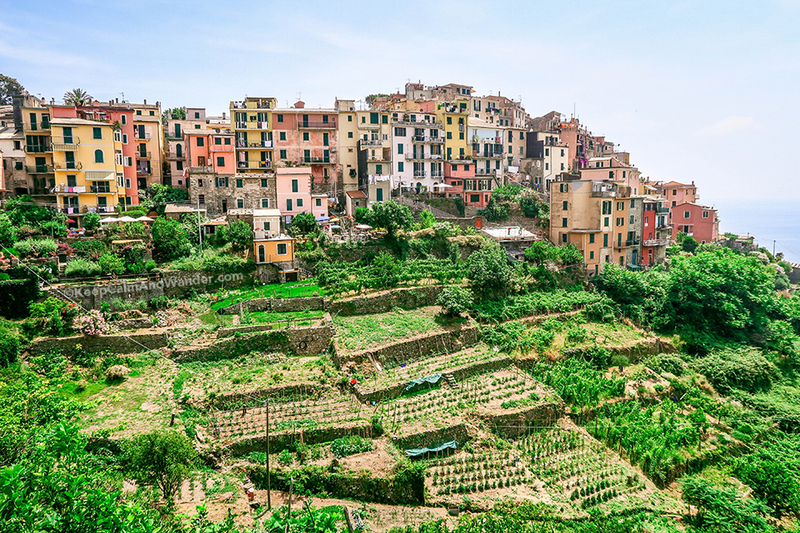 The five villages consist of – Riomaggiore, Manarola, Corniglia, Vernazza and Monterosso. All are accessible by a train than runs between all the villages. The main train from Pisa to La Spezia takes about an hour. If you are feeling fit you can hike between some of them high up in the steep slopes. Some of the hikes are ninety minutes or more so be careful as its blisteringly hot here at times. 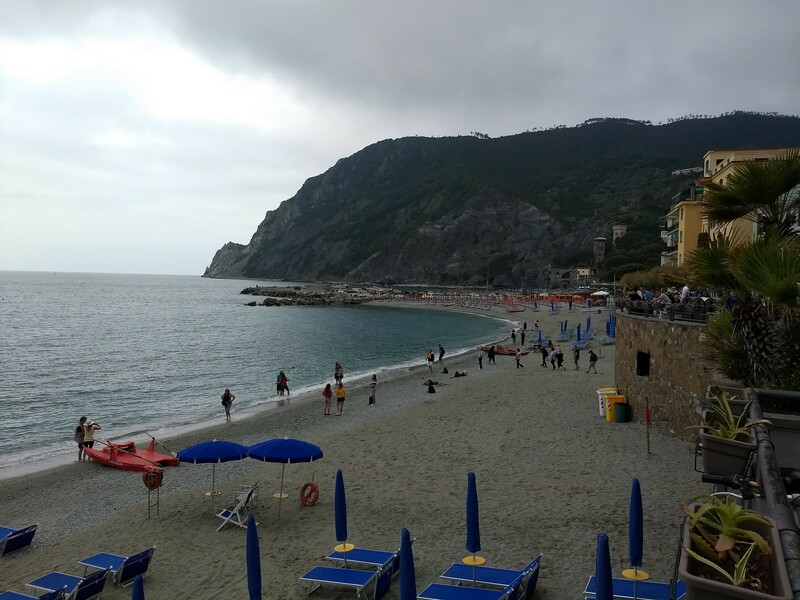 I started at the furthest village first Monterosso, this was the odd one out as it had a sandy beach beach . Its actually two villages really as there is the old town and a new town. 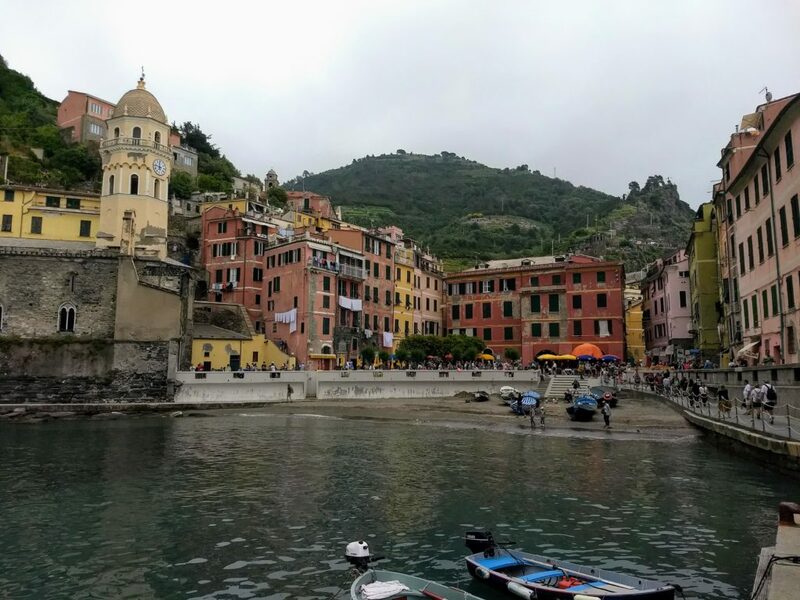 Next stop was the town of Vernazza. This has the only real harbour out of the five villages. The buildings are tall and very colourful, its amazing how many properties they can squeeze into such a small space. The middle of the five villages is Corniglua. 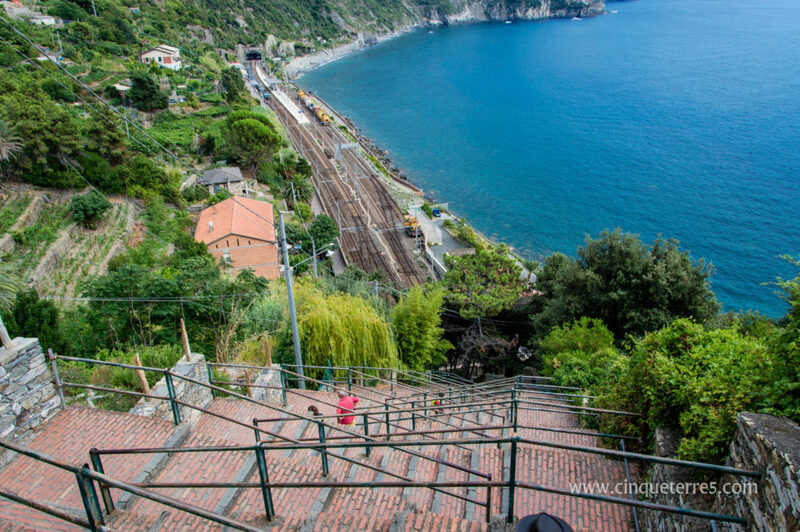 If you arrive by train then you have to climb the 365 steps (one for each day of the year) to reach the top. Or you could wait for the bus. It was hot and very busy – time for a break. 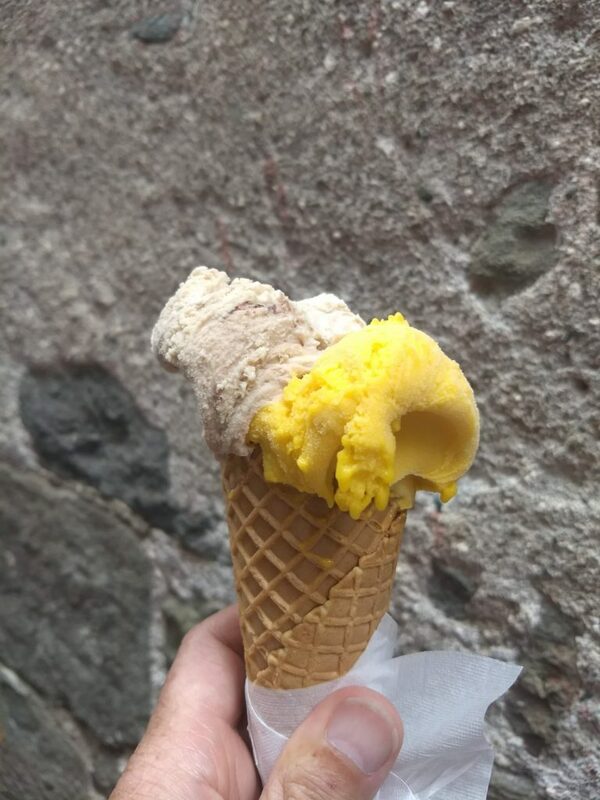 You can’t go to Italy and not enjoy the fabulous gelato available from virtually every street corner !! 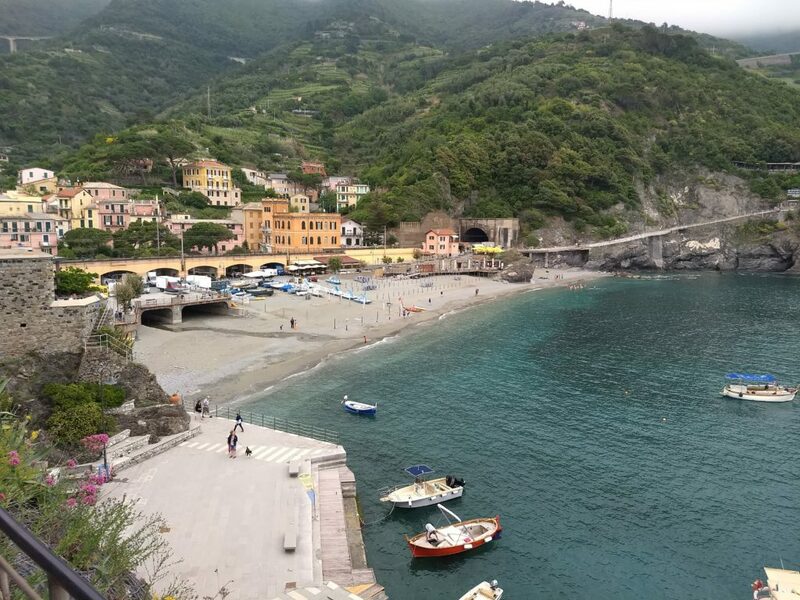 When you arrive by train into Manarola you may have to go underground from the platform to get into the town. This place has no beach or harbour so it’s all perched on the rocks next to the sea. 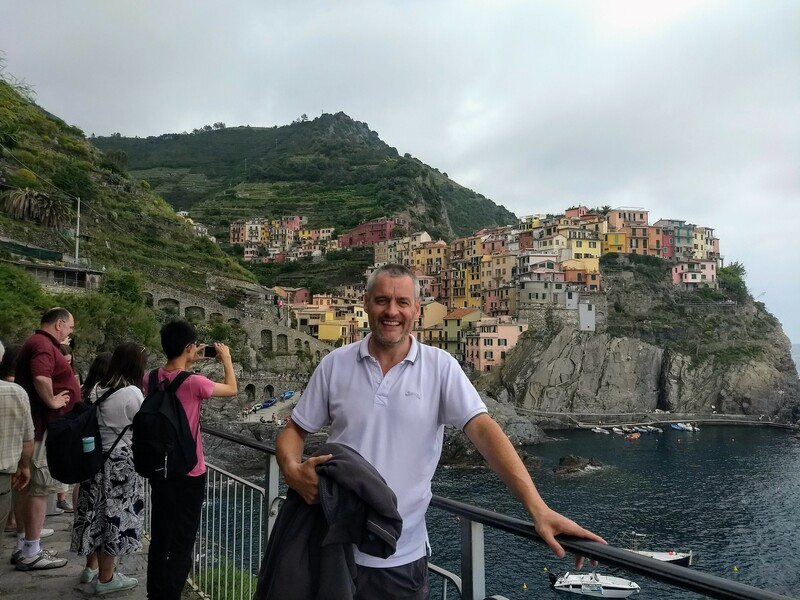 Last but not least was the town of Riomaggiore. Built into a very narrow crevice it has plenty more colourful buildings ! You can see all five villages in one day if you start early and use the train. But be warned it gets VERY busy ! It was only May but by mid morning it was already getting very busy so what its like in July/ August i wouldn’t like to think. You could easily spend a few days here and enjoy the hikeing and maybe stay in every village for a night to get a real feel for the place. 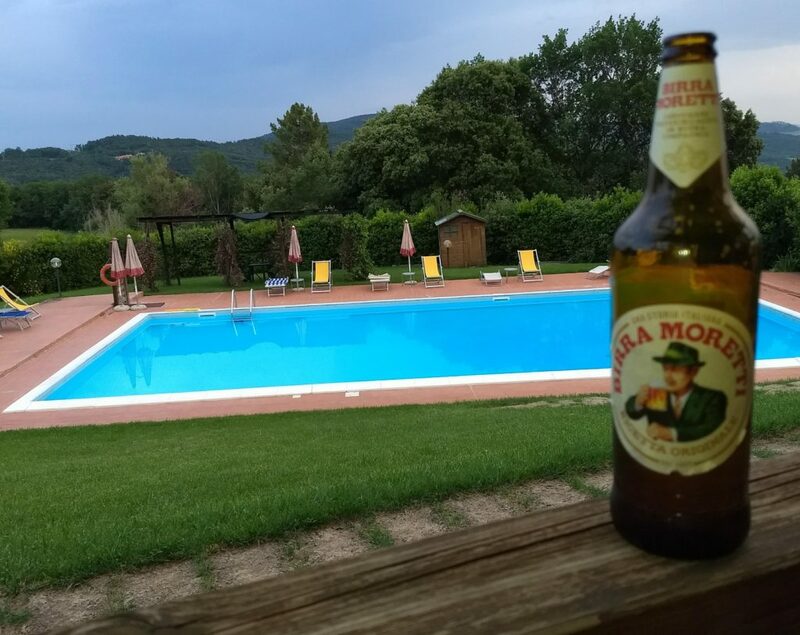 I got the train back to Pisa and back to my AirBnB, it had been a long, hot day. 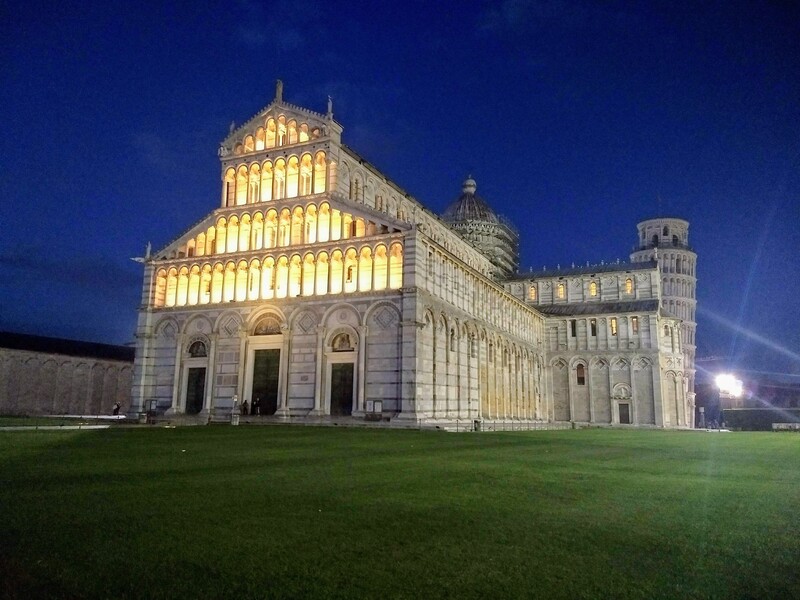 My time in Pisa was up so i returned to the airport to get my hire car. 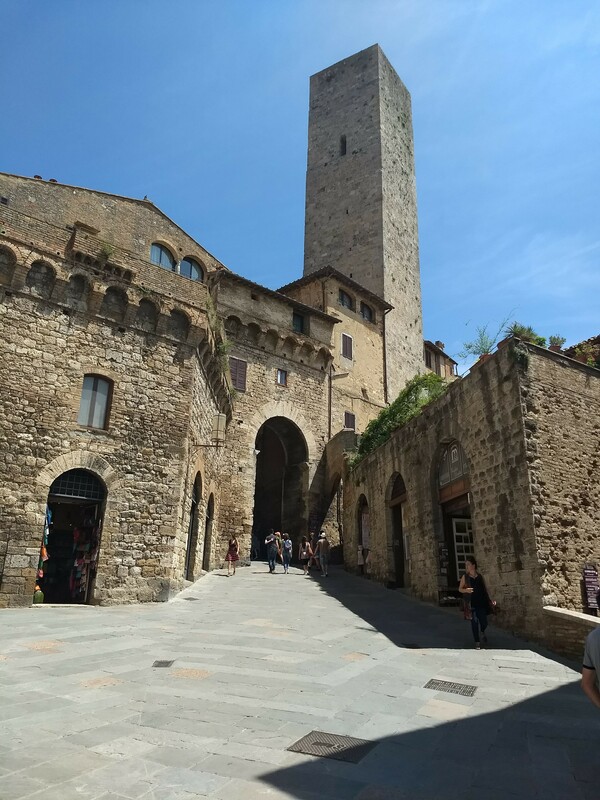 I headed south east and visited the 13th century medieval town of San Gimignano. 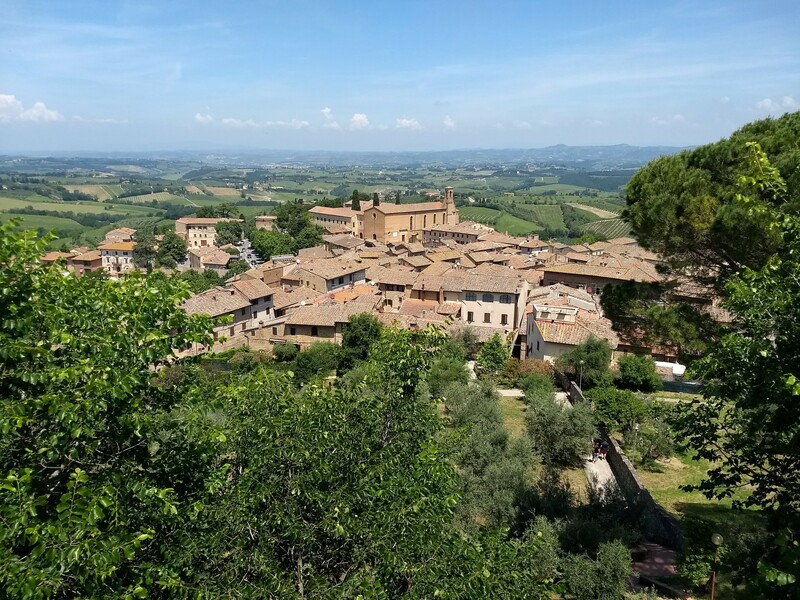 in the province of Siena. 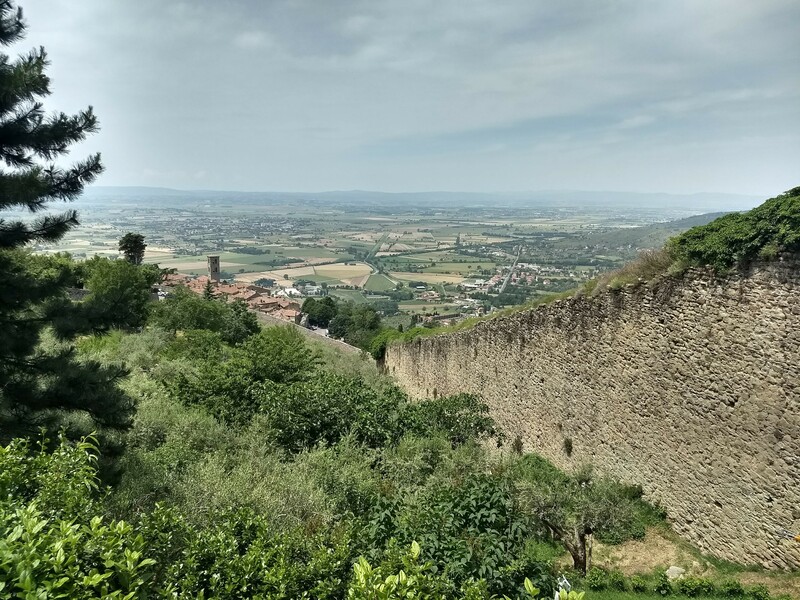 This Italian hill top town is encircled by these high walls. 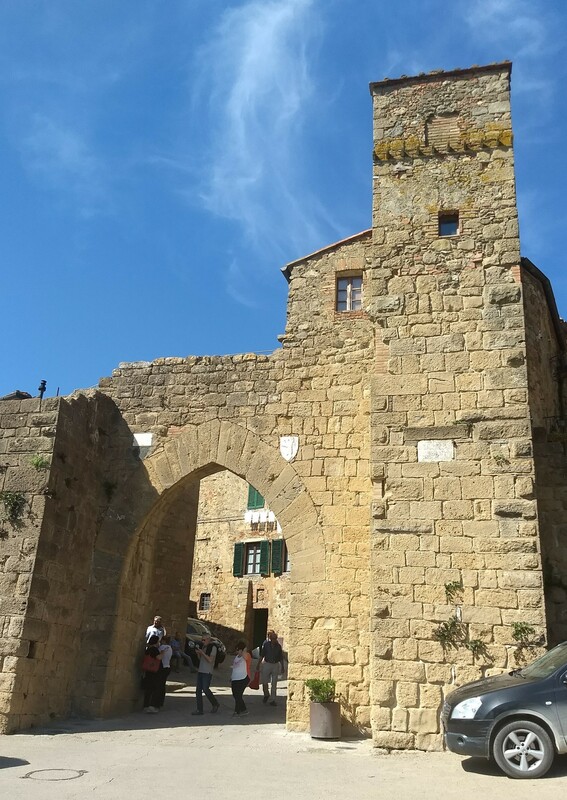 I drove through the area known as Val D’Orcia , a very picturesque area of Tuscany, on my way to see Monticchiello. 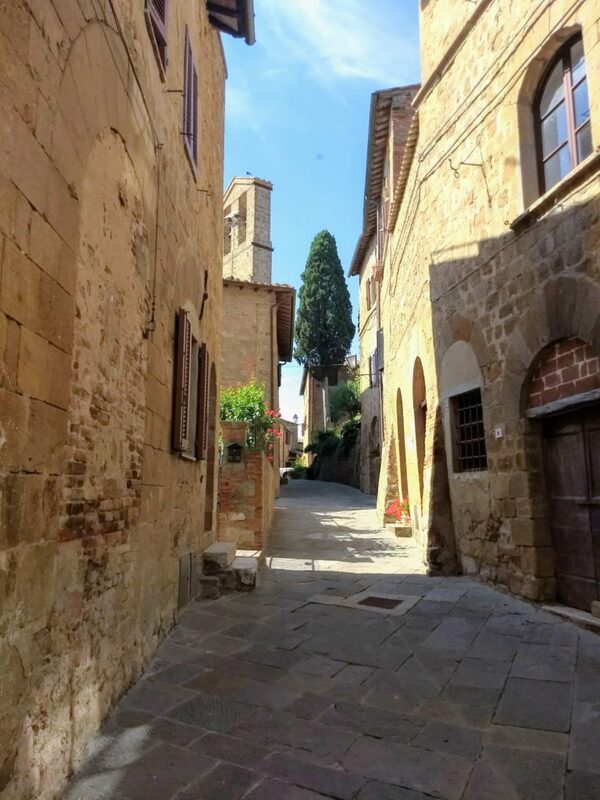 Monticchiello is another medieval town but much smaller then San Gimignano. 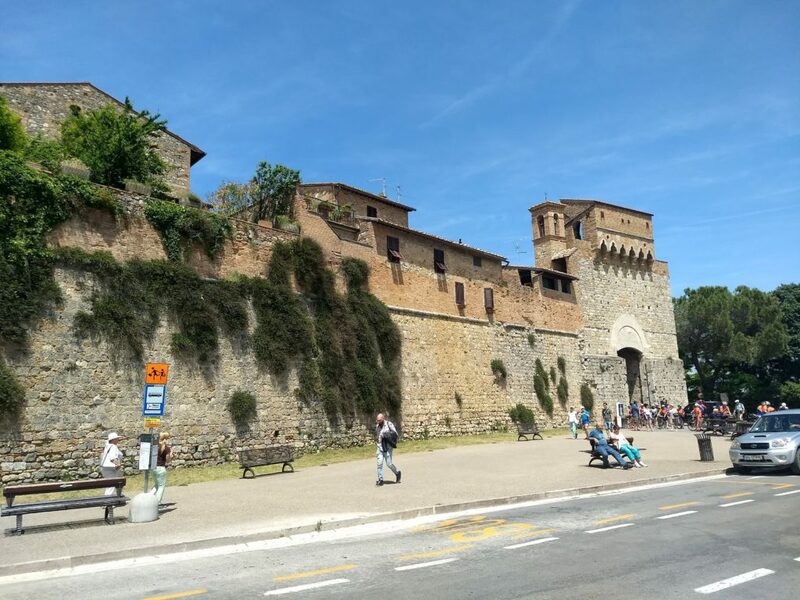 Monticchiello is a lovely town to visit if you want some peace and quiet. There were hardly any tourists and it mainly seemed to be residential. There were only a couple of places to eat one of which was just outside the stone walls. 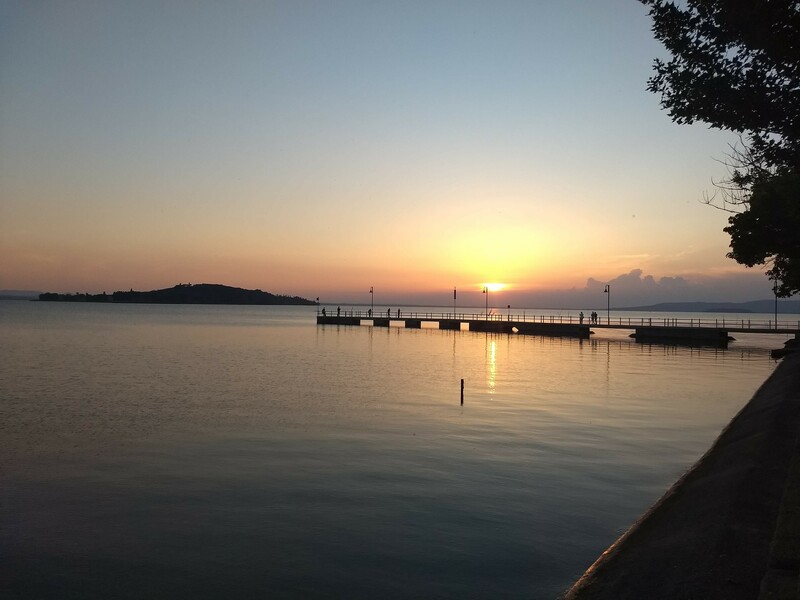 My evening stop was next to Lake Trasimeno in the center of Italy west of Perugia. 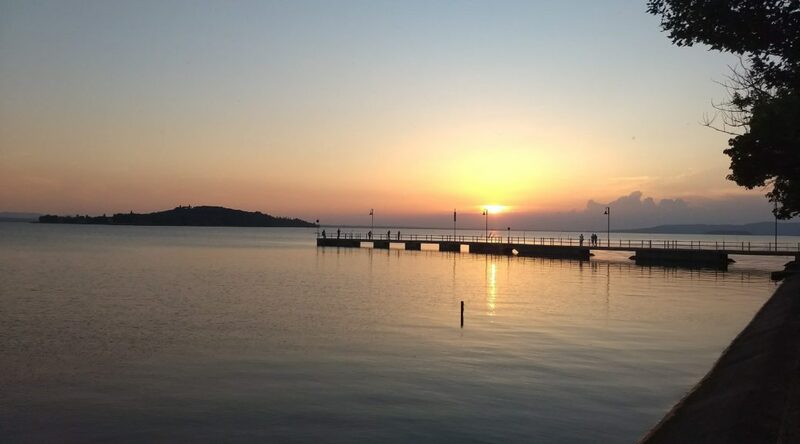 It is the fourth largest fresh water lake in Italy. 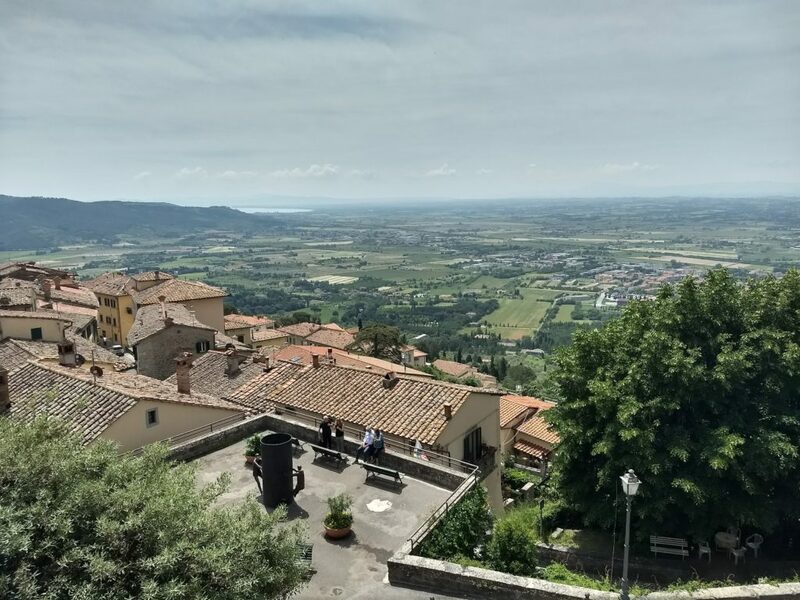 I had booked another AirBnB and was drawn in by the photos showing a fantastic view from the terrace. 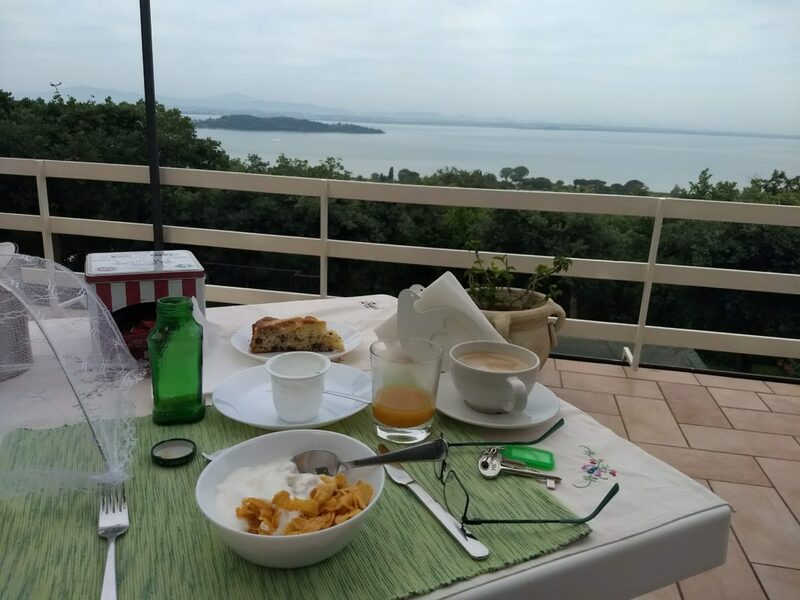 It certainly lived up to my expectations with a great view from the room and also from the large terrace where you can have breakfast. The family owned house was recently renovated, it was nice that the house had been kept in the same family as it was built by the current owners father. It had to be one of the best AirBnBs i have stayed at, great value and just look at that view !! There will also be a pool to use in the summer months. Francesco and his wife made me feel very welcome, i wish i could have stayed for longer. 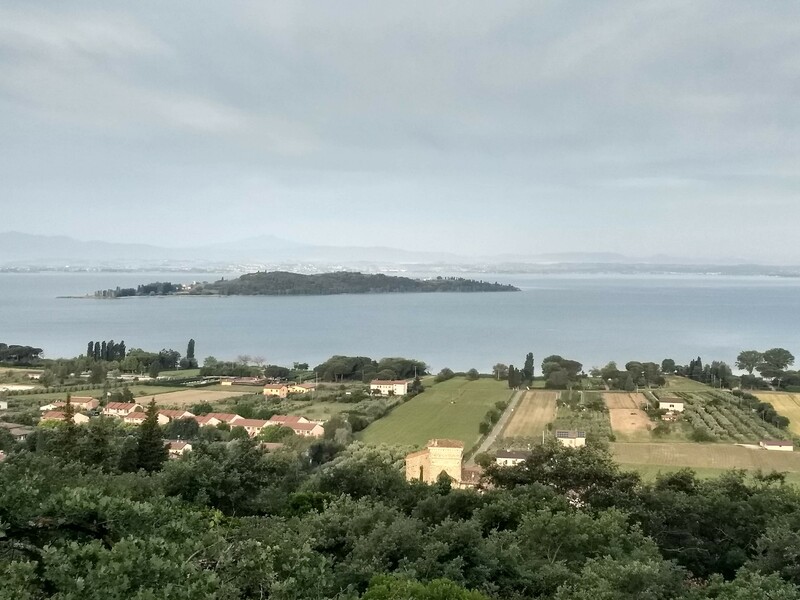 I left Lake Trasimeno as i had to head back into the heart of Tuscany for the wedding in Il Castagno. On the way back was the town of Cortona, yet another medieval hill top town !! Always great views from these hill top towns !! 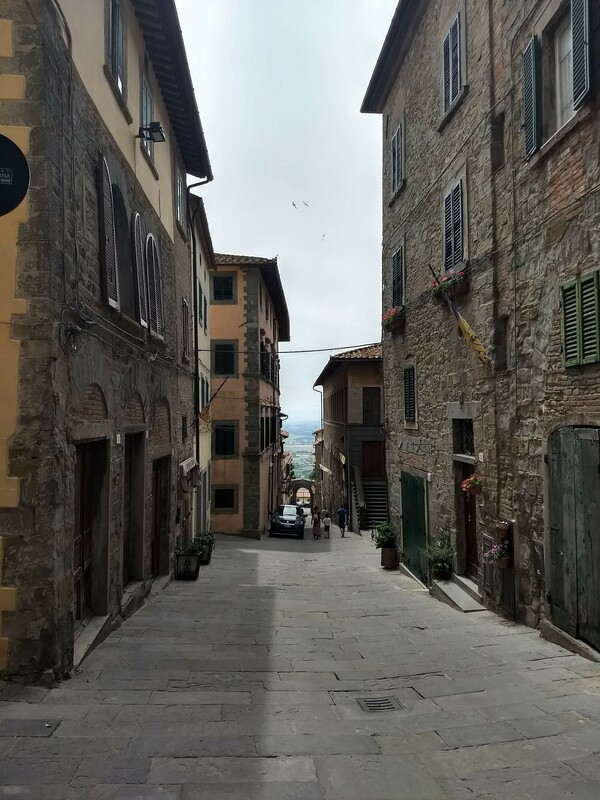 Cortona is famed for its steep narrow streets. 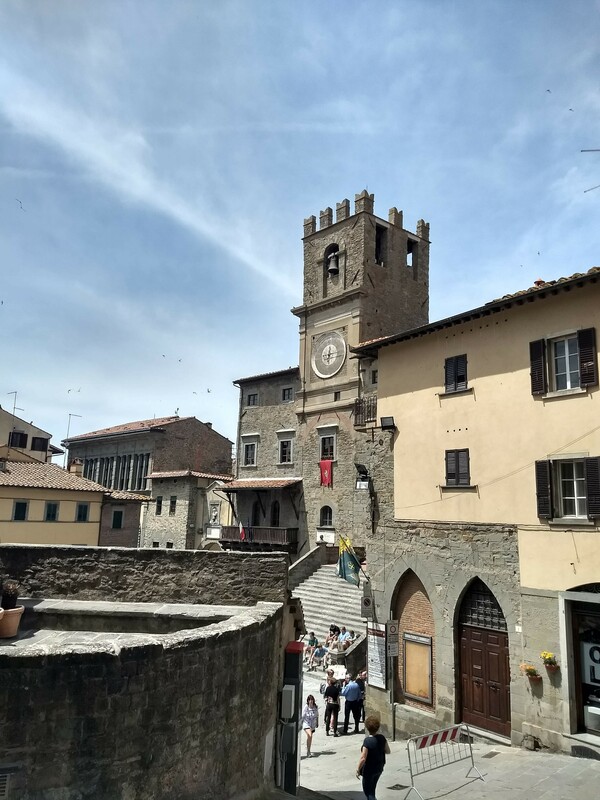 It was a quick visit to Cortona as i needed to find my accomodation in Il Castagno. 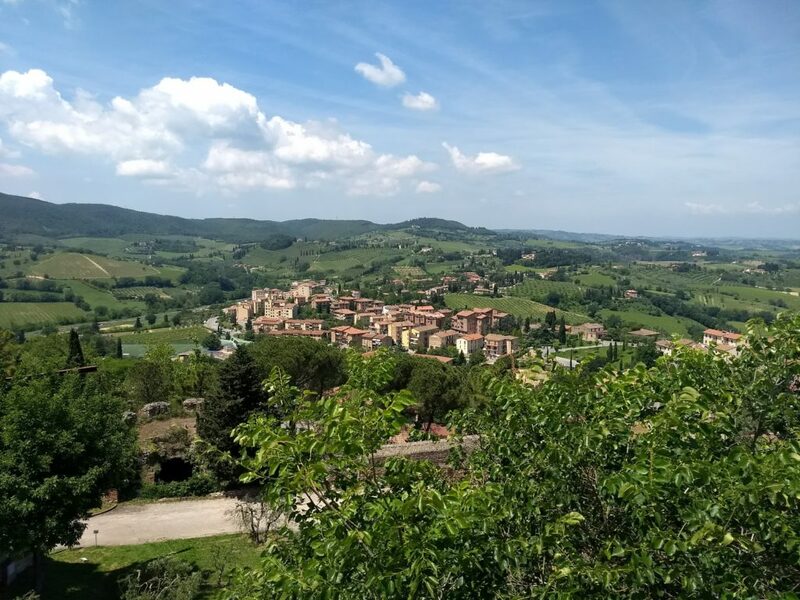 Only a couple of hours drive through the Tuscany countryside was my accomodation for the next 3 nights. A converted farm house made into seperate villas with a communal pool outside. Just what i needed as the weather was hot, hot, hot !! 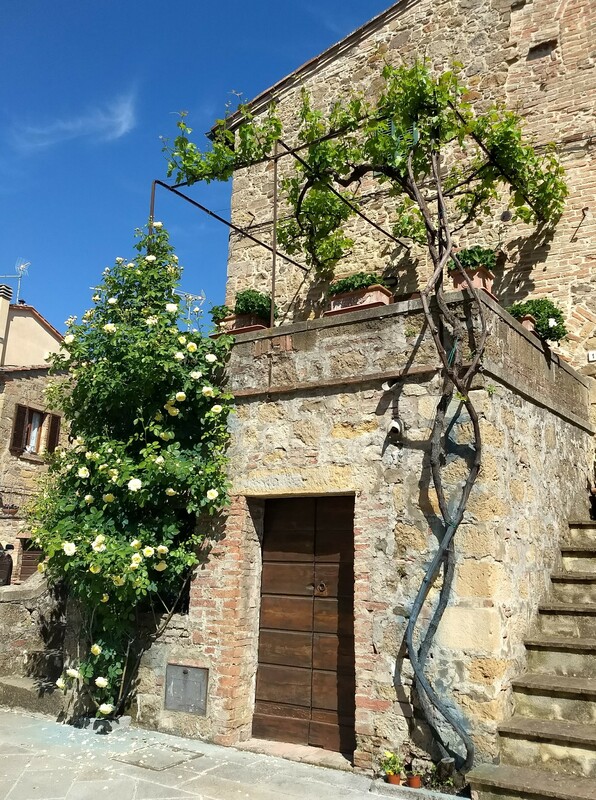 It was a nice but all too short break in Tuscany. You could spend days just driving around and admiring the countryside and views. You will of course find many, many medieval hill top towns to stop and admire so i don’t think you really need to plan which to see. 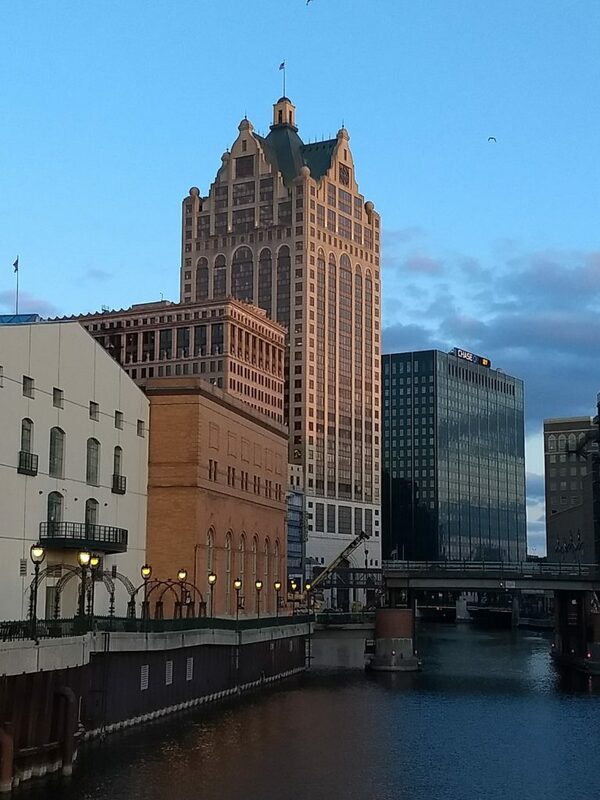 Getting out of Minnesota I decided to visit another state and hopped on the Megabus to Milwaukee. No particular reason why but it was on the edge of Lake Michegan and I had already visited Lake Superior. At the edge of Lake Michegan, at least this one wasn’t frozen !! I wasn’t sure what title to give this little trip but as you will see I seemed to spend most of my time visiting breweries. So had to call it ‘Brewery Tours Milwaukee’. 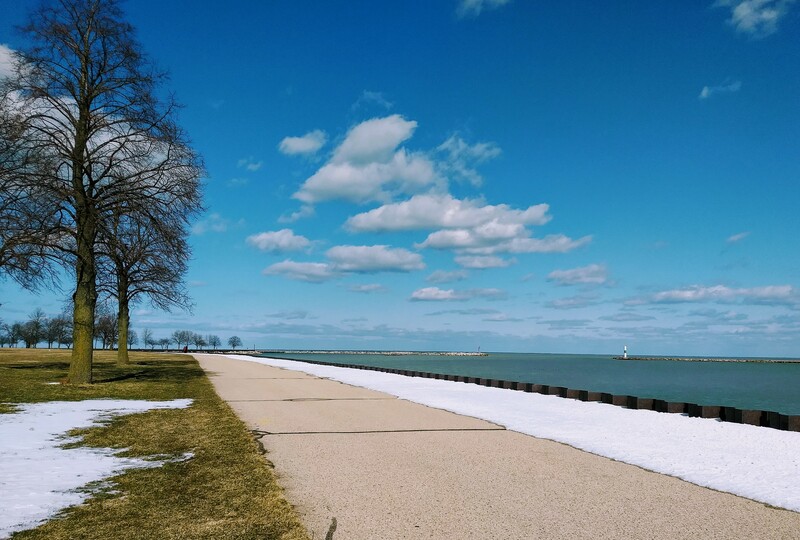 I originally stayed on the north west side of the city but it was a little run down. I often walked past this church which I always thought you be at the start of a horror movie. In the city center there are plenty of river walks to be done that follow either side of the river. 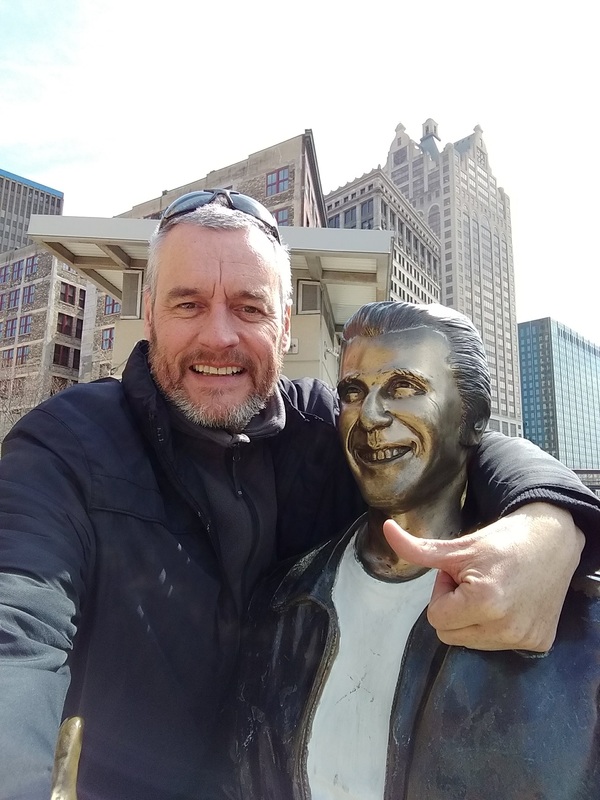 Imagine my surprise to bump into the Fonz along one of these river walks ! I’d forgotten that the massively popular ‘Happy Days’ TV series was set in Milwaukee. Not too sure who the artist was but i’m unsure whether they got a second chance………. 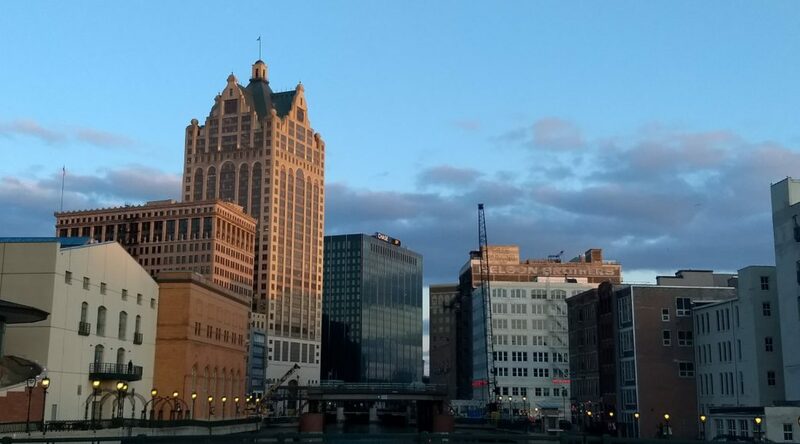 Milwaukee is known as the city that is built on beer. 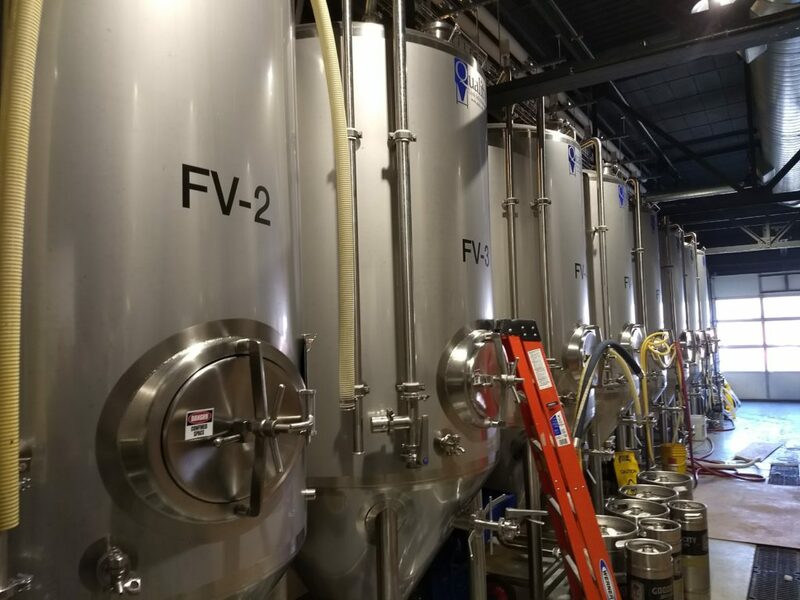 There is literally dozens of breweries making a name for themselves in Wisconsin. 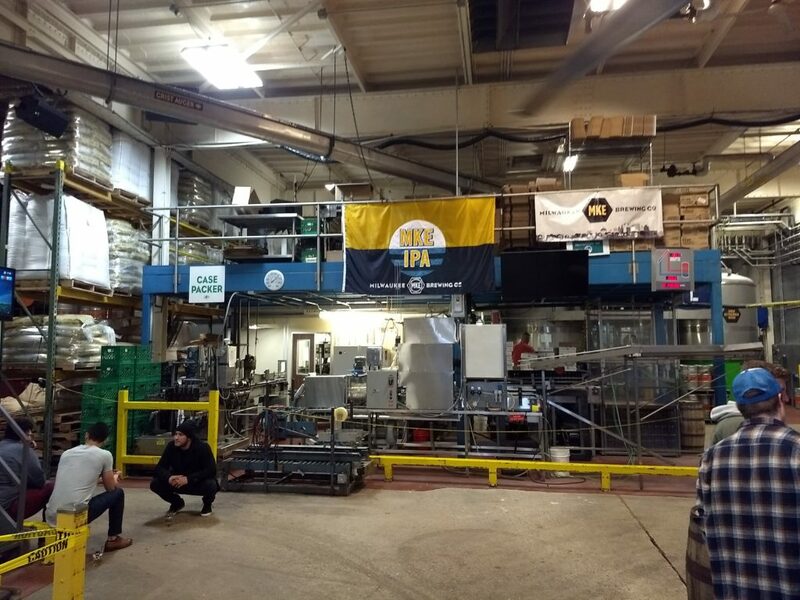 I decided to visit some of them by booking a tour that takes you to some of the smaller craft brewers. 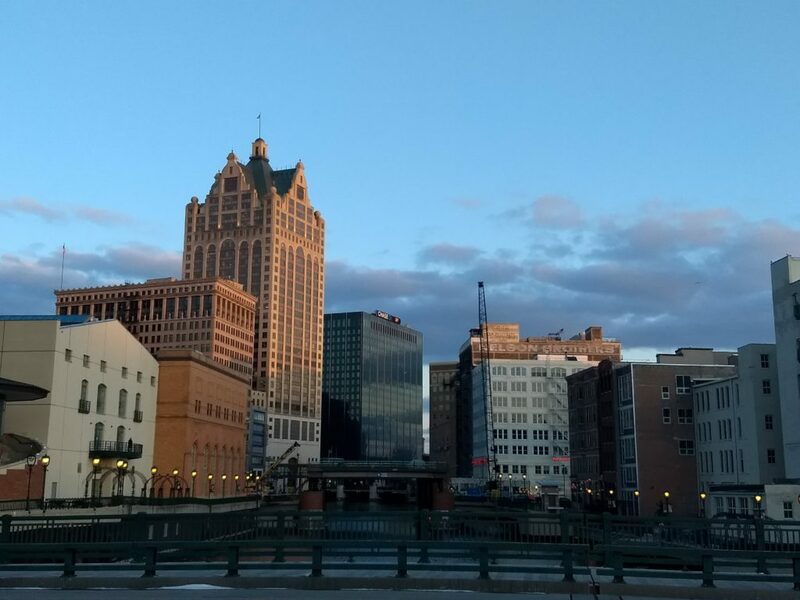 The bus left central Milwaukee and drove us out to our first stop which was the Twisted Path distillery. We were welcomed by a very enthusiastic owner and a rum cocktail. Various spirits were made here including different vodkas, rums and gin, all were certified organic spirits. What i like about these places is that they are not just distilleries or breweries, but have their own bars on site so you can buy at source. Some places serve a full menu also so why go anywhere else ?! Next stop was a brewery called Good City Brewing. They went big and built a brewery with restaurant and bar facilities on Farewell Avenue in the east side. 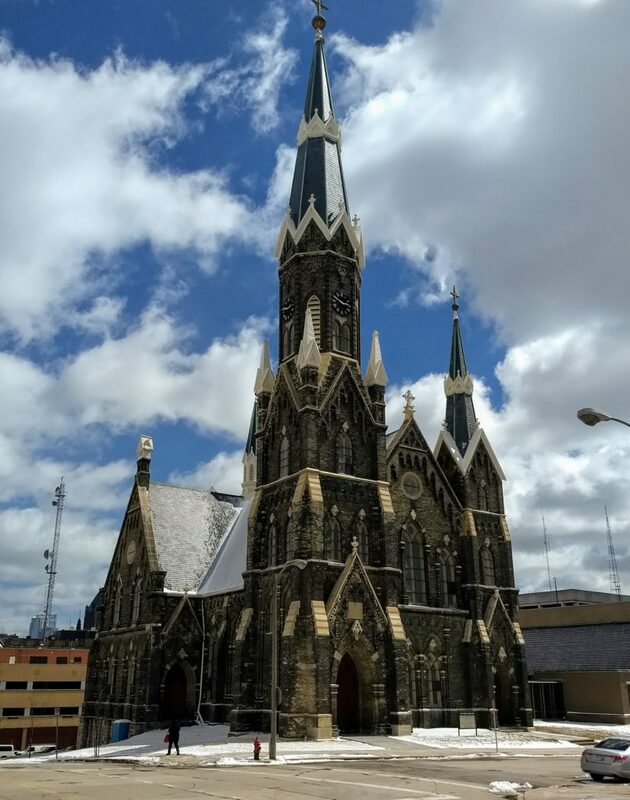 They are also now building a new pilot brewery and tap room in the downtown area opening in 2019. So not exactly one of the smaller craft brewers anymore but still worth a visit as the food sure looked good. 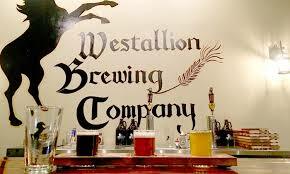 Another stop on the tour and my personal favourite was the husband and wife team of Westallion brewing. This set up epitomises the smaller craft brewing fraternaty. 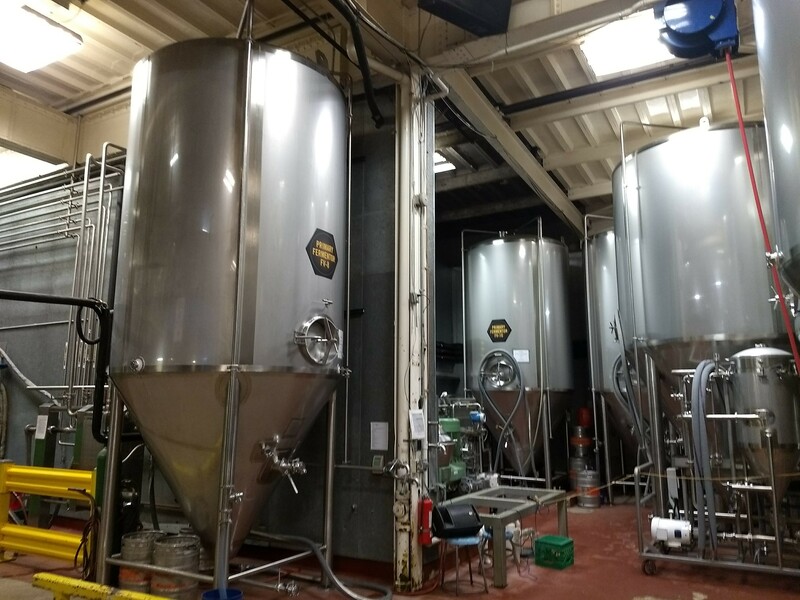 The owner grew up in the West Allis area, some might say a rather neglected suburb of Milwaukee, and thats where he returned to start his own brewery business. The owners were very welcoming , the bar had a good atmosphere, and everything seemed right with the world. 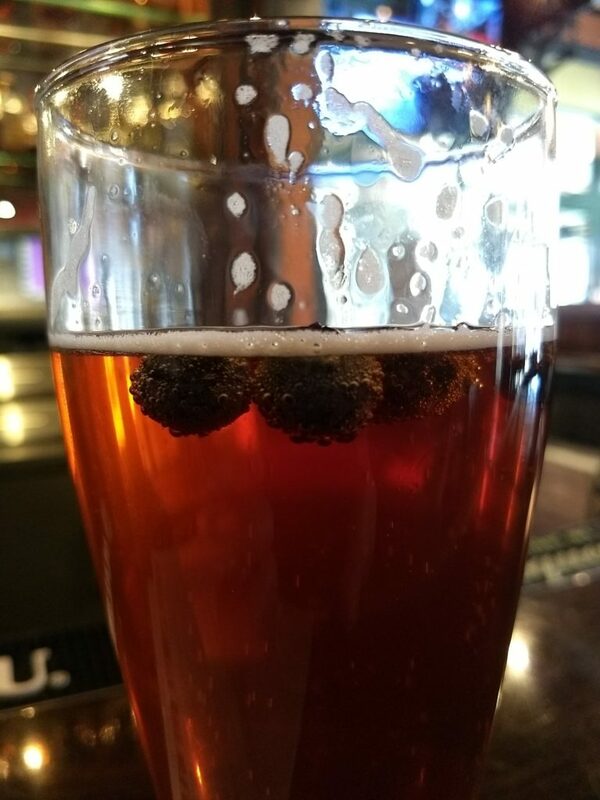 If i remember correcty i tried a pint of their Scottish ale and Vienna lager. Both enjoyable, drinkable beers and could have easily stayed their for the rest of the afternoon. But there was another brewery and some more beers to taste !! 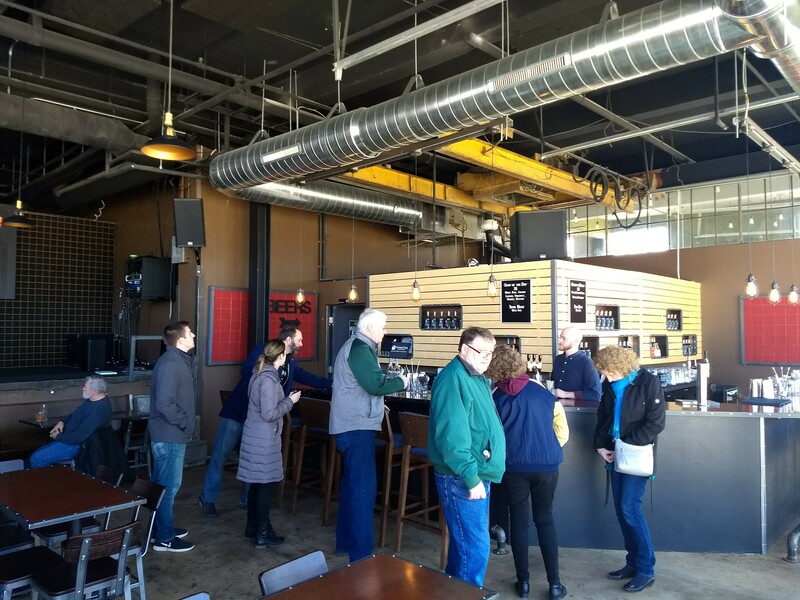 The last stop on the tour was the Urban Harvest Brewing company. This place had a big bar, seating for many, stage for live music, and even another stage around the back for other events. 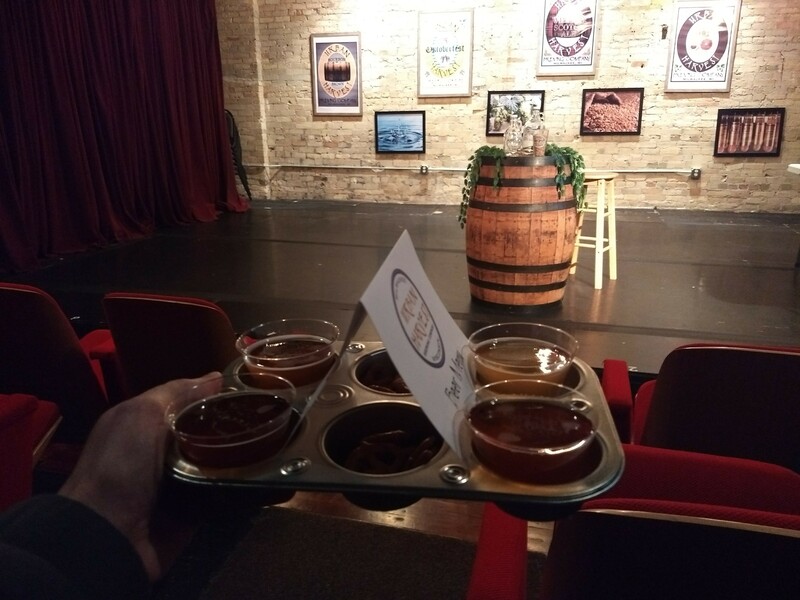 We were escorted to the rear stage where we were given a selection of their beers to try. This was another place i could easily have stayed at for the rest of the afternoon. The bar was bustling and everybody was having a good time ! Whilst on my afternoon bus tour of breweries i heard about the MKE brewery tour. Whats different about this tour is that you pay your 12 bucks and then drink as much beers as you can in 2 1/2 hours !! 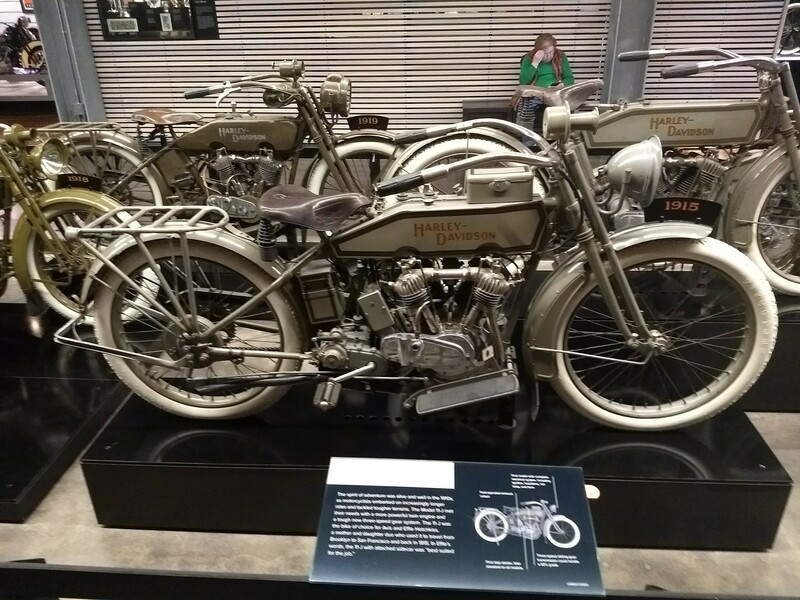 Had to check this out so booked a tour online and turned up on a sunday afternoon. You can start trying the beers half an hour before your tour starts and half an hour after it ends (approx). During the tour which is about an hour long you also have a break where you can return to the bar to try another variation of their beer. They were certainly brave in brewing their beers. Many different flavours and strengths were encouraged, i remembered chocolate, mint, Cheerios cereal, etc, being used. They had one that was just ready called O-Gii, a beer thats infused with green tea and gjnger. If thats not enough its left to age in Gin barrels, be careful though as it packs a kick at 10% ABV !! The brewery were doing so well that they were soon to move into a new bigger location. This was clearly the BEST brewery tour ever in the history of mankind. I stumbled upon yet another brewery whilst out sight seeing in the city center (honest). This was the Lakefront brewery. It was here i tasted their blueberry beer. Now i’m not normally a fan of all this mucking around with different ingredients, i mean beer should be beer right ? But thus tasted pretty good i have to say and even had real blueberries in it which must be part of your 5-a-day ? I had to stop visiting breweries as it was just too much fun. 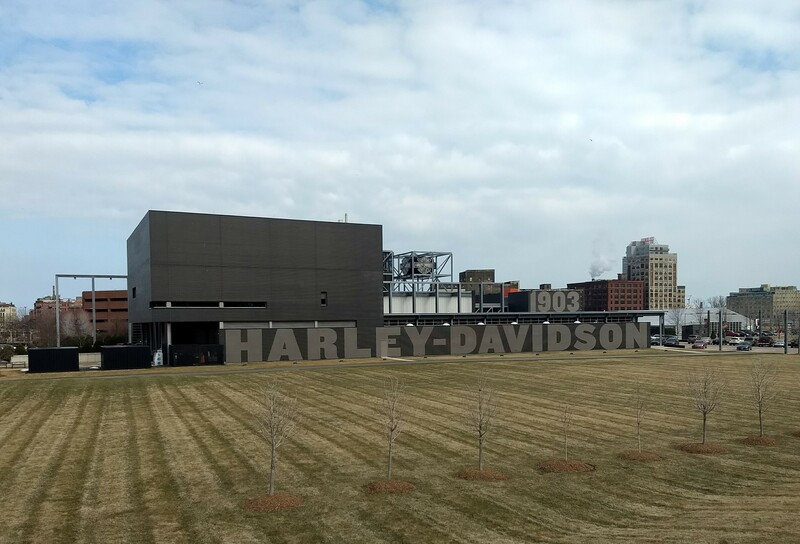 I turned my attention to the Harley Davidson museum, an impressive building on the west side of the city. They certainly have had an interesting history, how they are still here i’m not sure. 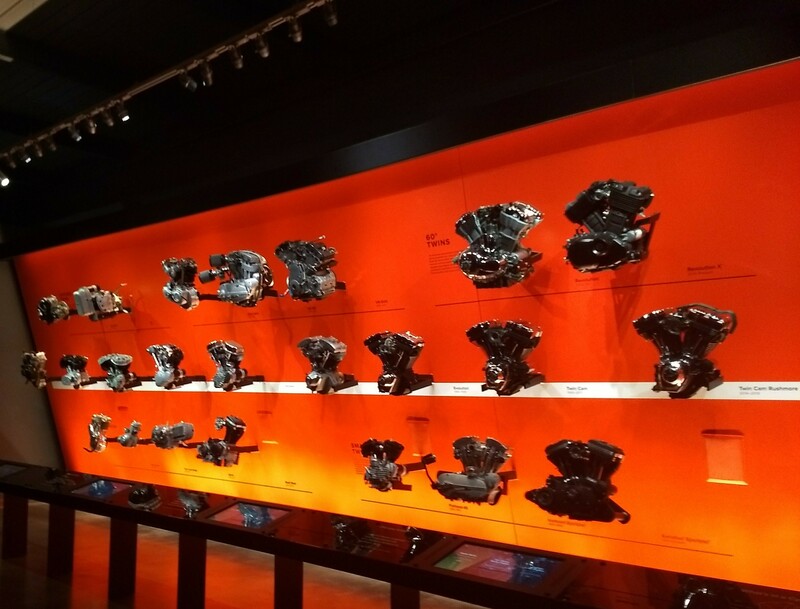 They have faced various stages of bankruptcy, management buy-outs, more threats of bankruptcy, the story goes on. I think they held on by the skin of their teeth purely because of the American bikers and their passion for the brand. 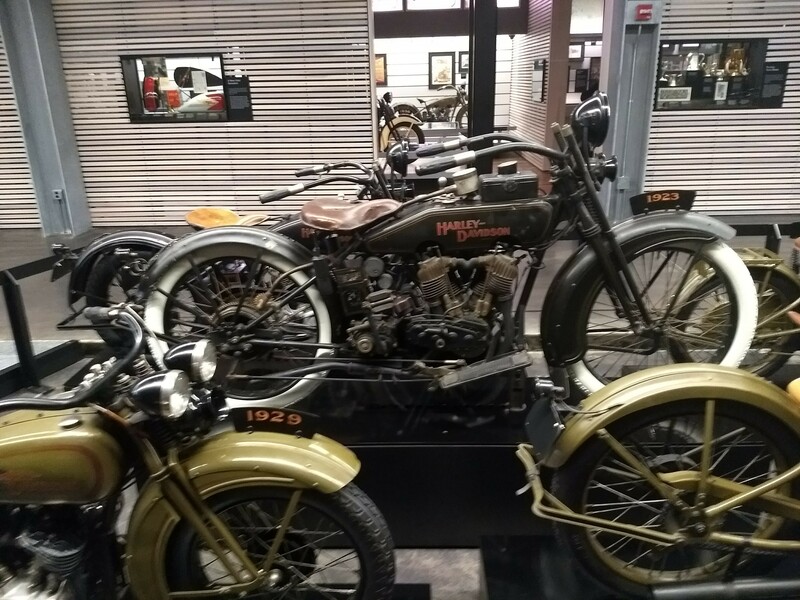 Harley Davidson isn’t just a brand its a way of life. 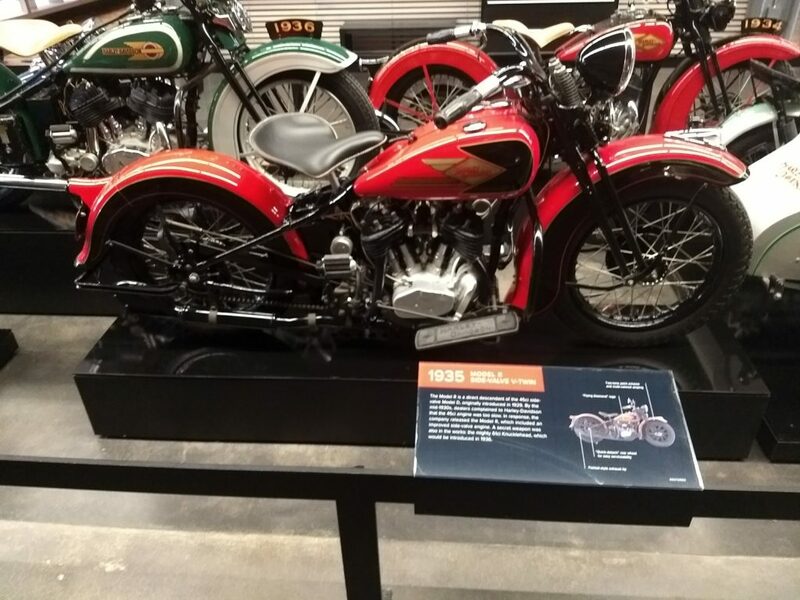 I had no idea that Buell motorbikes were part of Harley-Davidson. 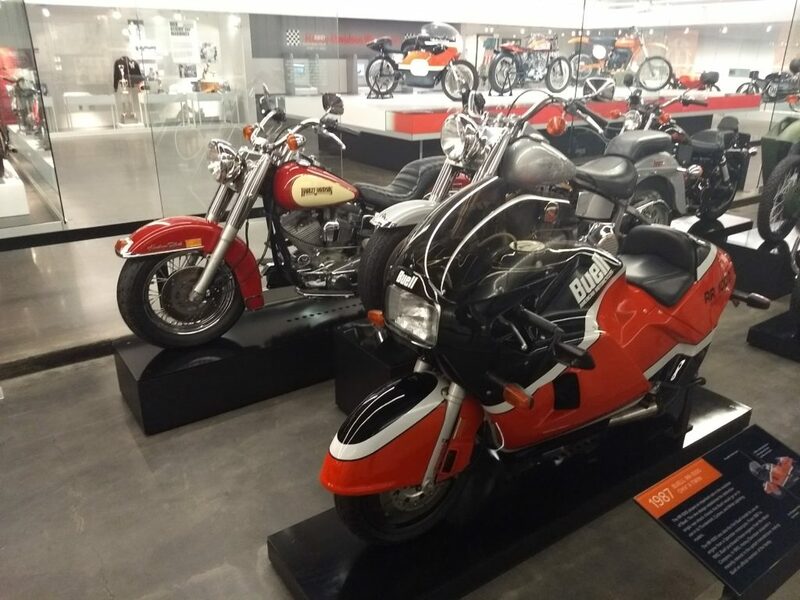 Started by an ex Harley-Davidson engineer employee in 1983, Harley-Davidson bought 49% in 1993 and the whole in 2003. 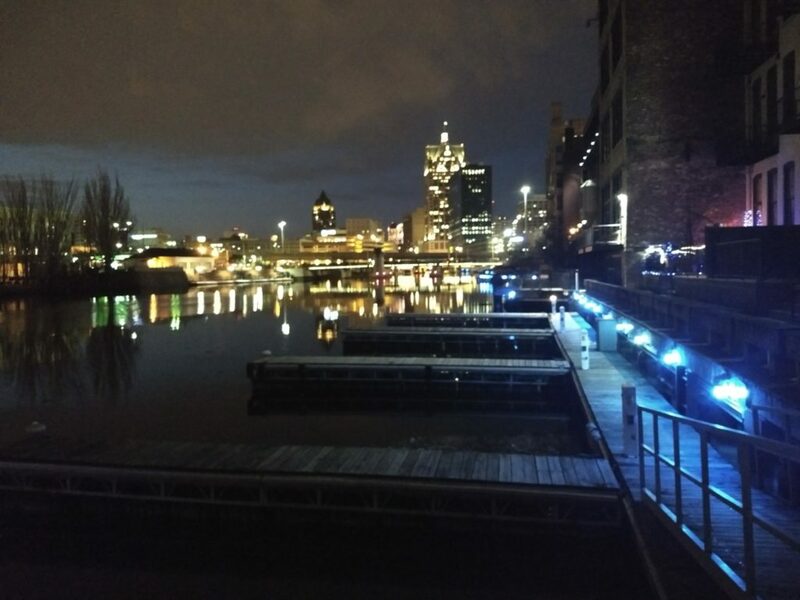 My week away in Milwaukee had come to an end so headed back to Minneapolis (to sober up). 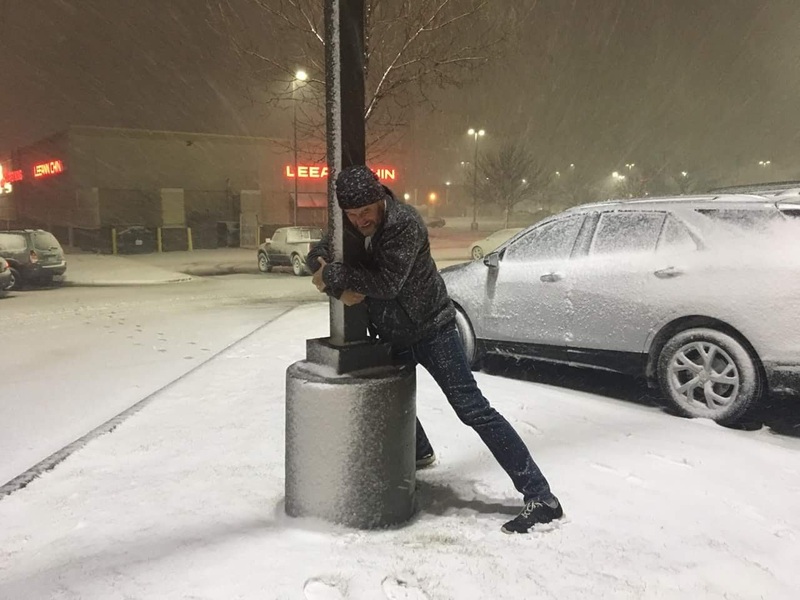 Imagine my delight to return when another snow storm/blizzard was just arriving. This was me having just left the pub on our way to another but decided against it so we went back in !! 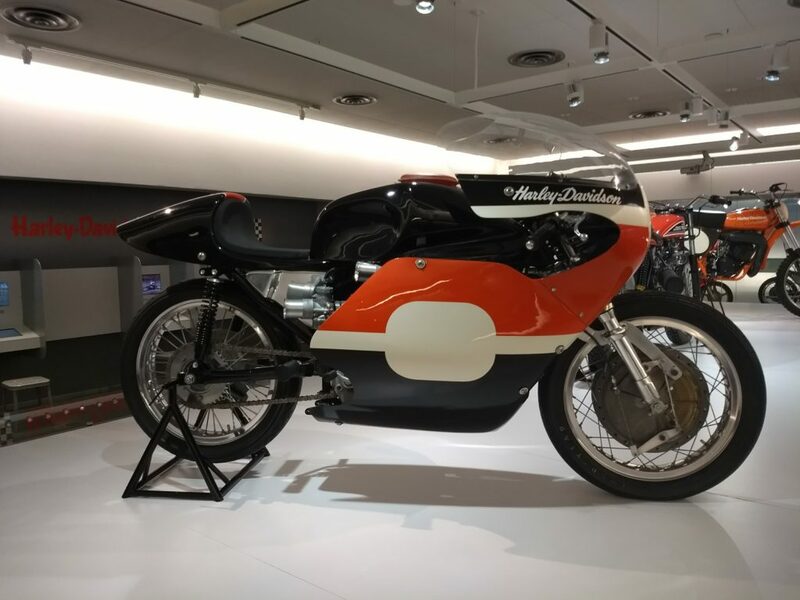 As the Fonz says – ‘Heey ! !’.